Chupe, a richly textured soup or stew, is popular in South American cuisine. In Peru especially, the dish is used to bring out the flavors of the Andes and the sea. Many different meats might be used in the recipe – in fact, some Peruvian cities assign a different preparation to each day of the week. 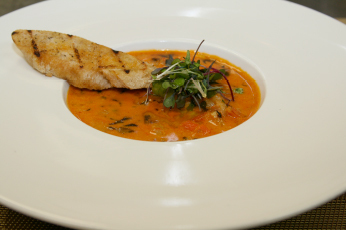 During this chilly winter, legacy Executive Chef Chris Cramer of the Sonesta Coconut Grove Miami wanted to share his warm, spicy version – a great antidote to cold winter winds. For helpful hints, be sure to check out his “Food Notes” following the recipe. Over medium heat, sauté the onions in olive oil then add the aji amarillo paste, let cook for two minutes. Add the garlic, tomato, aji panca and shrimp base and cook for 10-15 minutes. Add the white wine and water and bring to a boil. Add the potatoes and carrots and cook until tender (about 10 minutes), then add the choclo and cook for another 10 minutes. Next add the queso, huacatay, oregano, heavy cream and shrimp and simmer for 5 minutes. Add green peas and rice and bring to a quick boil. Cut baguette on the bias, brush with cilantro oil and grill. Place soup in bowl, garnish with micro greens and serve. Huacatay. This black mint is usually sold frozen in 1 lb. bags. Aji Amarillo paste is typically sold in 8 oz. jars. Choclo is a giant fresh frozen corn, usually sold in 1 lb. bags. Aji Panca is usually available in an 8 oz. glass jar. Queso Fresco is a fresh white cheese.